SyncFab is a blockchain based platform that has created a peer to peer market for small and medium sized enterprises in the face of the enormous product marketing challenge. SyncFab will provide a comprehensive solution for small and medium-sized producers to be well-accessed, so that the goods produced by these producers can be sold based on global market product demand. These small and mid-sized companies will be incorporated into the SynFab peer-to-peer market using the Decentralization App, all manufacturer data will be well stored in the application. making the application aimed at small and medium sized enterprises to become decentralized and supply chain more transparent, efficient, and sustainable. The use of the SynFab app is very easy because it has been supported by the MFG utility token. 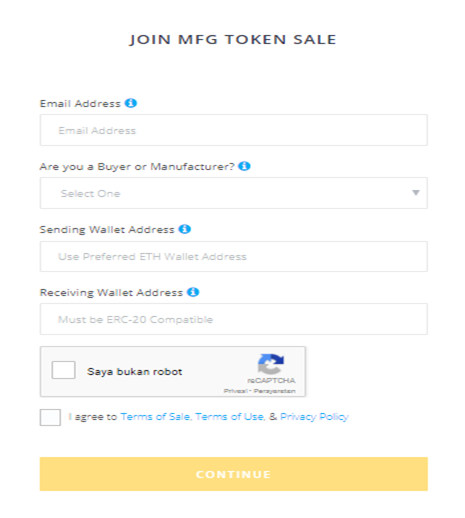 You will be taken to the MFG Token Purchase page, follow the steps to smooth the purchase of the MFG token. Step 3. You must copy the address of the SyncFab wallet, on the right. This address is for deposit. Step 4. Send funds from your wallet. You are allowed to use your preferred wallet (Coinbase, Gemini, Kraken, Exodus, Jaxx, etc.) To send funds to the deposit address listed above. We recommend using MyEtherWallet (Compatible with ERC-20). Step 5. Verify your transaction. Once your transaction is submitted, you will receive a Transaction Key (TX) which can be checked in Etherscan.io to verify whether your transaction is successful. Verification and status checks will take some time to record blocking Ethereal — please be patient. Step 6. 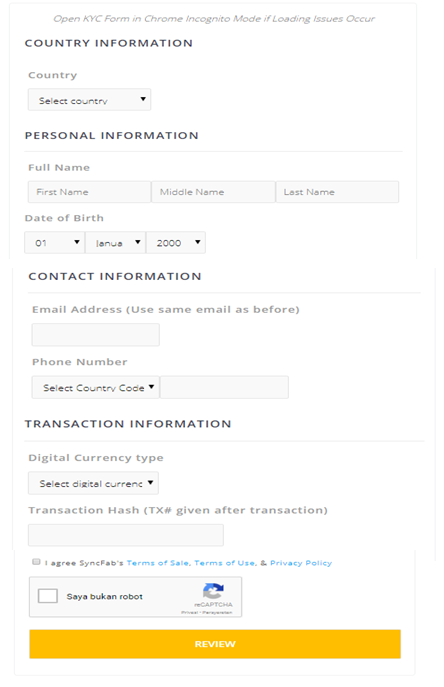 You must complete the KYC Form. To ensure the authenticity of your personal data and prevent money laundering. You will receive an MFG Token after the SynFab Main Sales ends. And click Review, the purchase process ends. To verify that you have successfully added to the whitelist you can ask directly at Telegram SyncFab group. Now you have bought Token MFG at pre-sale stage and in main selling stage (UTC). You’ll love being part of the SyncFab project. For more updates, you can follow the social media below.